Guest Post by Frank Martinez/ “Trucky McTruckface”. 147 miles of history, in the middle of nowhere. Yup. 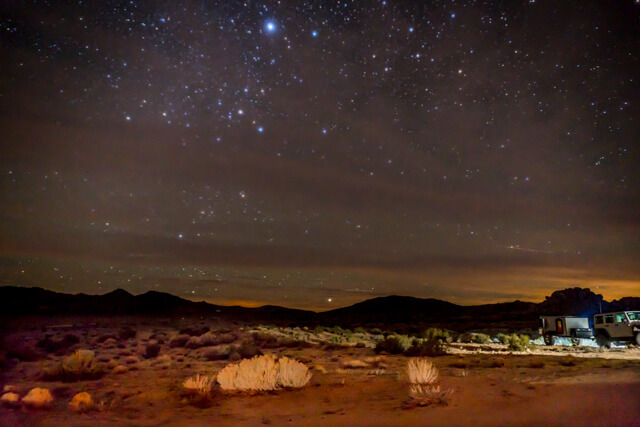 That’s the Mojave Road. 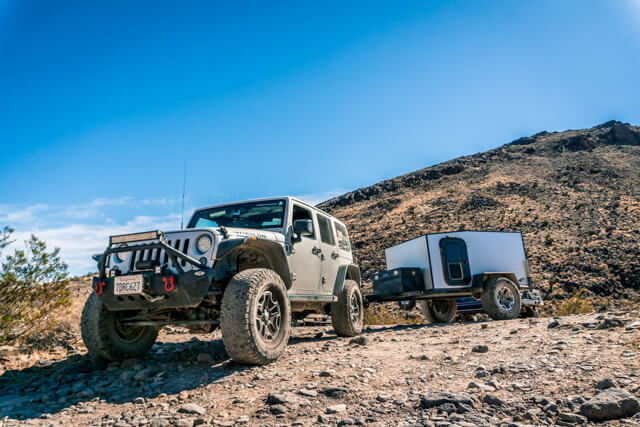 As long as I have been into overlanding this route has been one that keeps bubbling up in conversations. No matter who you talk to, where they’ve been. 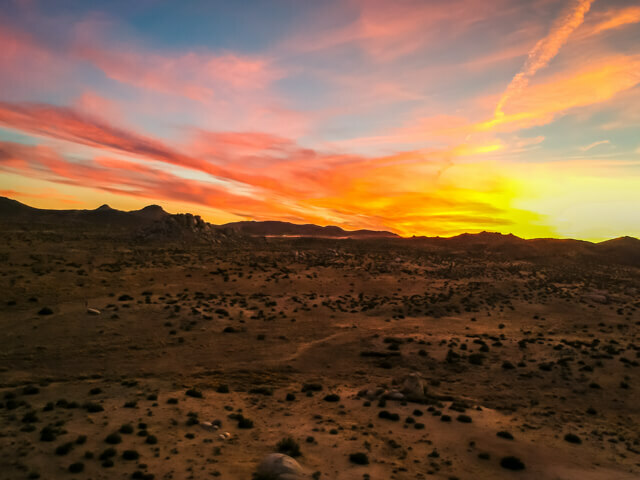 When you talk about Southern California adventures eventually you end up talking about having done the Mojave Road or hoping some day you will. I knew about a year ago I wanted to take this adventure on. 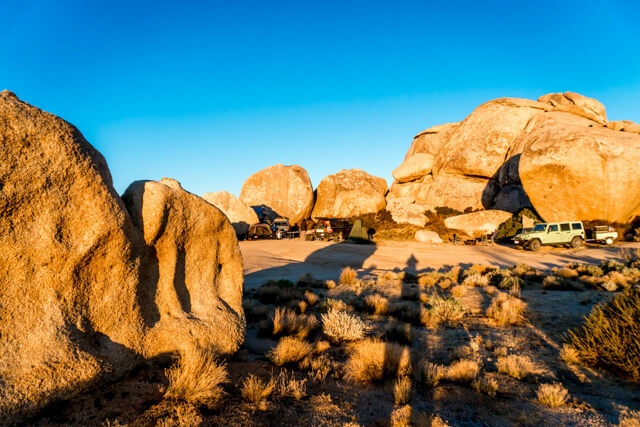 Not just because it’s 147 miles of dirt road with every terrain possible in the Mojave, but because it has a rich history and numerous geological wonders all wrapped into one trip. 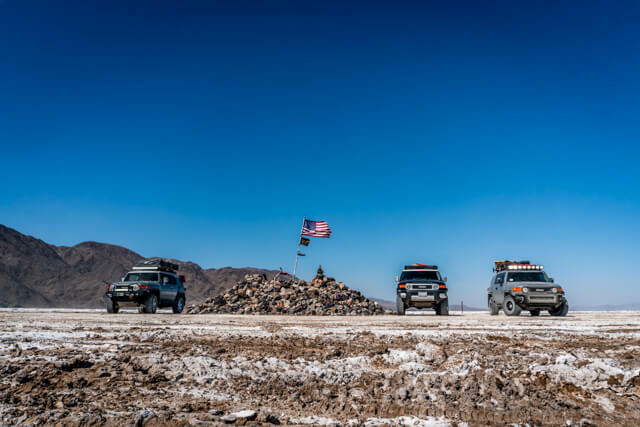 The Mojave Road is equal parts about the people you meet, the people you travel with, and strange traditions these two bring to the Road. So let’s begin The Mojave Road. 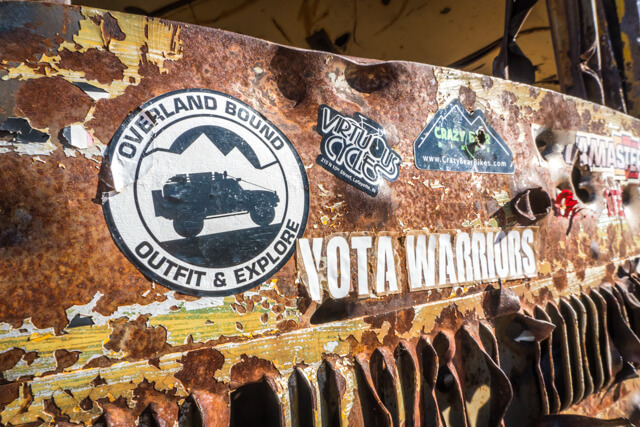 My adventure began early, rolling out at 5am from Orange County to meet up with 4 guys from Southern California Overland Trail Association (SCOTA). SCOTA had planned this trip that I was invited on. We drove east, picking up SCOTA folks as we made our way to the Colorado River just south of Laughlin, NV, where the Mojave Road begins. We enjoyed banter along the way over the radios and got to know each other as we passed areas of adventures past. It was a great way to start. 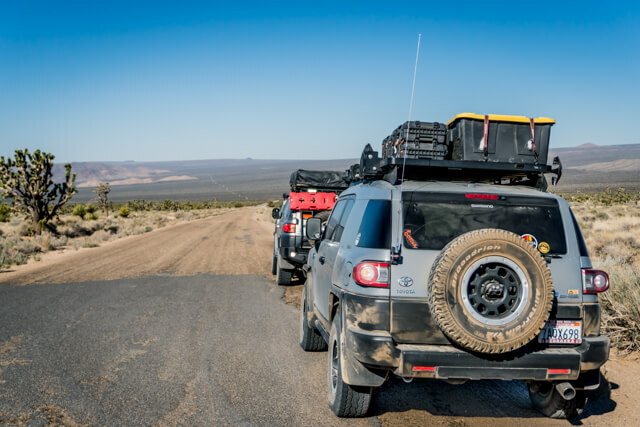 Once in Nevada we fueled up drove the remaining mile to the trailhead, aired down and began our trek. Our first stop was Fort Piute. 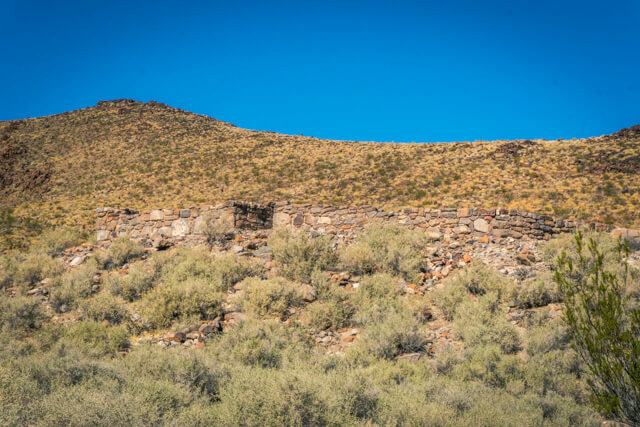 Fort Piute is an old outpost of Fort Mojave, one of many on this route. 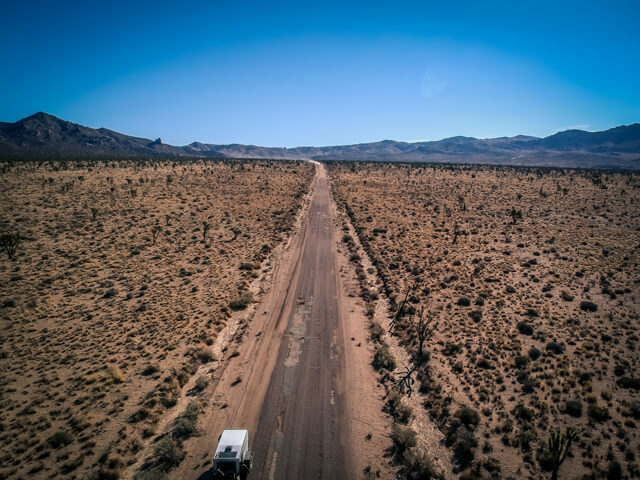 A little history, the Mojave Road started out as Old Government Road then Mojave Trail before it got the name it has now. This is important because depending on your map/gps you may see a any variation of the 3 on any given section. 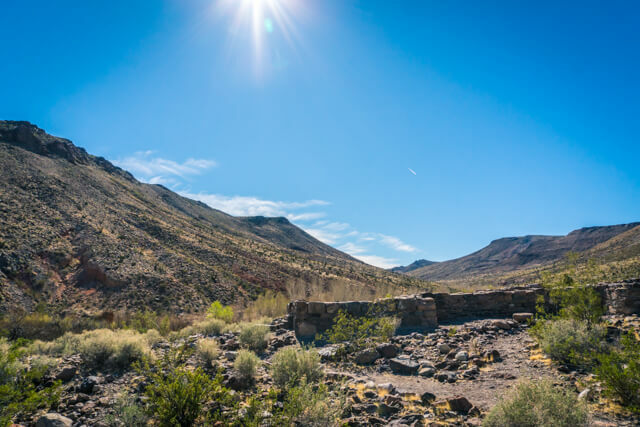 Back when it was Government Road, in 1867, Fort Piute was built by the US infantry to protect the natural springs and the mail route between Fort Mojave and San Bernardino. There’s a lot more history to these outposts if care to search. We explored the old fort that is now ruins, checked out some Native American petroglyphs. We made this our lunch spot and took in the gorgeous scenery and history. 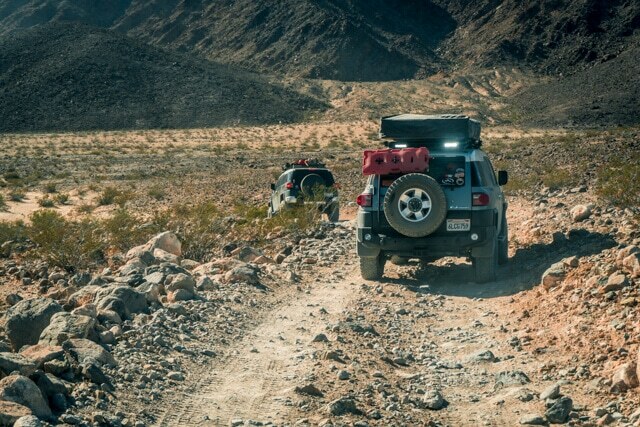 From there we hit the road taking the long rock garden trail out of Fort Piute to a sandy road that sits about 12-14” below the desert floor, making for an amazing tunnel-like feeling. 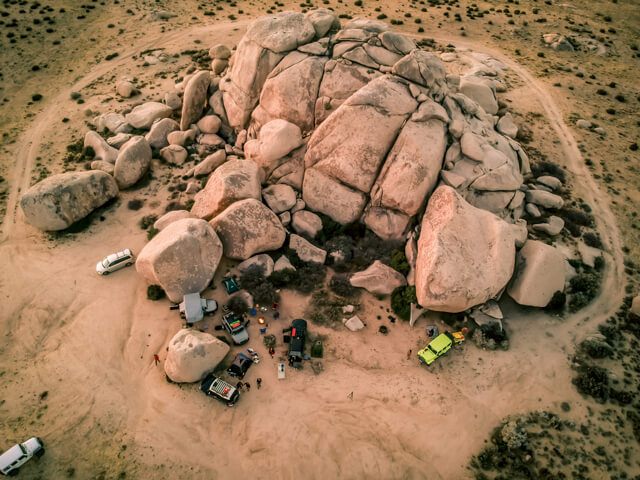 Add to that the largest densest Joshua Tree forest I’ve ever seen and you really start to appreciate what the Mojave has to offer. 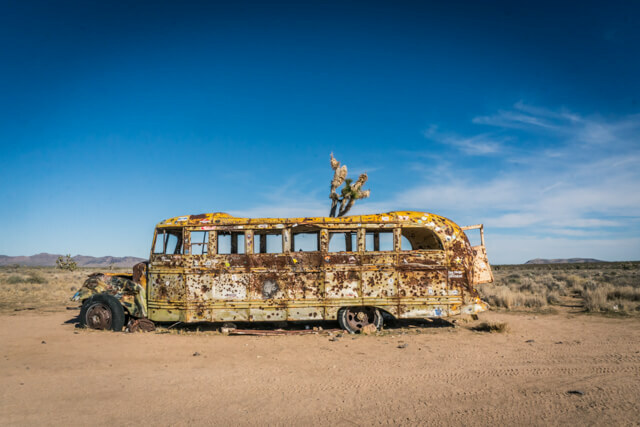 That gave way to a clearing and an old school bus just sitting out in the middle of the desert. 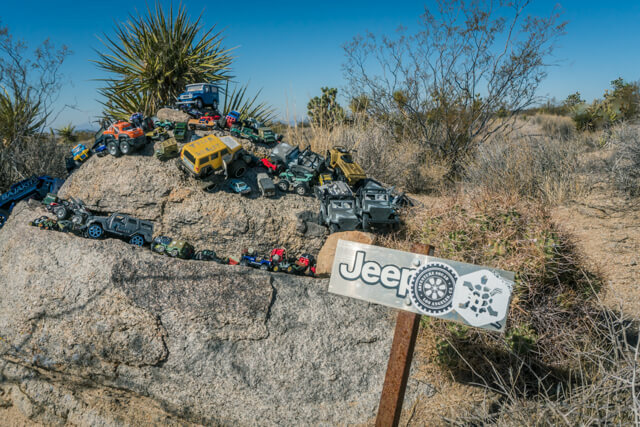 It’s become another stopping point for tourists and travelers of the trail to take photos and add their mark by way of a sticker. 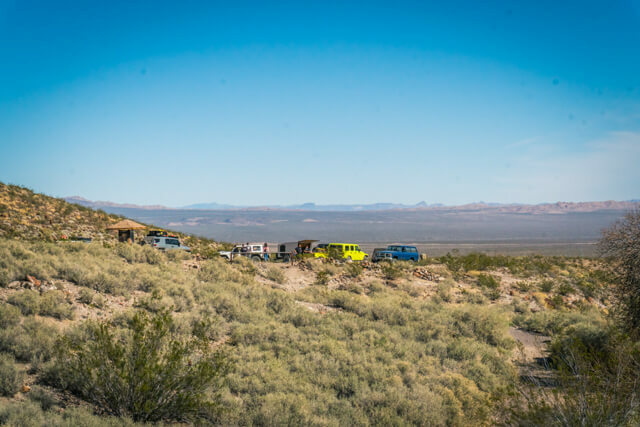 We lined up the rigs, took some shots and chatted with other travelers of “road”. From there it was a quick pace on a nicely graded road. 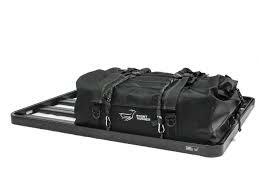 Time to open up the throttle and find a campsite. I have to say, we scored! We got to Midhills about 3-4pm, beating the campground hunt rush. 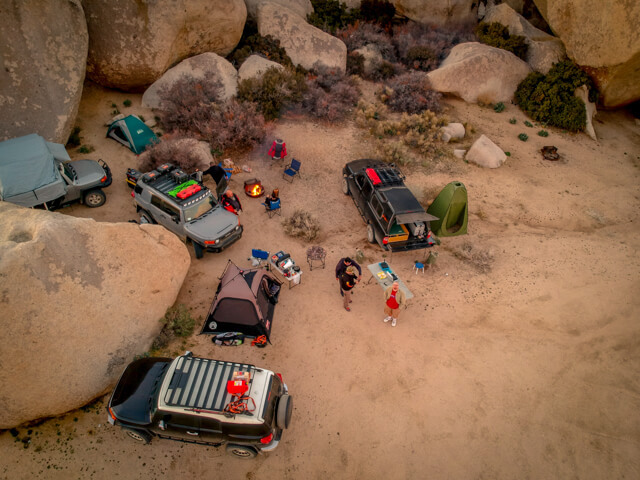 Scored a gorgeous spot in a rock outcrop protecting us from the overnight desert winds and providing a great backdrop for camp. 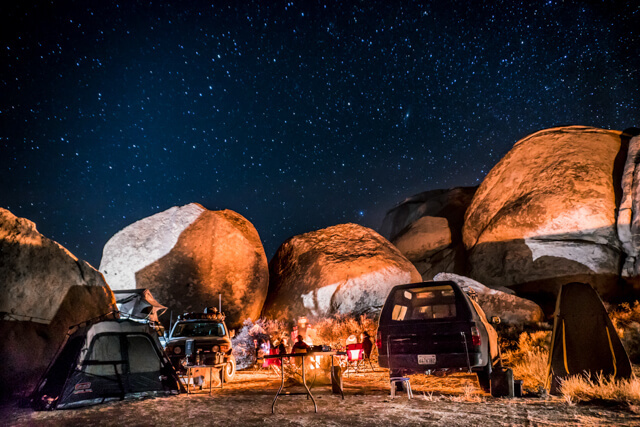 The night was clear and moonless making for perfect stargazing under the night sky with a warm fire crackling as your soundtrack. Seriously, it was perfection. Come morning I would have sworn the terrain was more gorgeous than I remember driving in. At a chilly 35 degrees, when the sun crested that first eastern peak it was like a kiss of pure warmth as the hills lit up in gold. 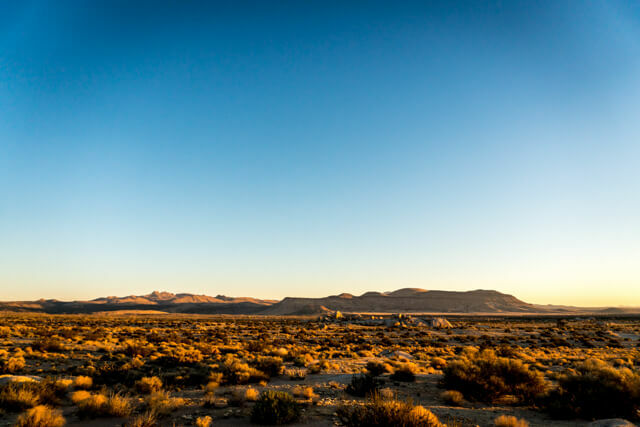 It was time to continue our journey, we made one stop as we rolled out of midhills at a stunning view that showed our path cut clear across the landscape into the horizon. Unfortunately, Tim, our jeep guy had to bail at this point. Leaving 4 of us to continue this trail past that horizon. 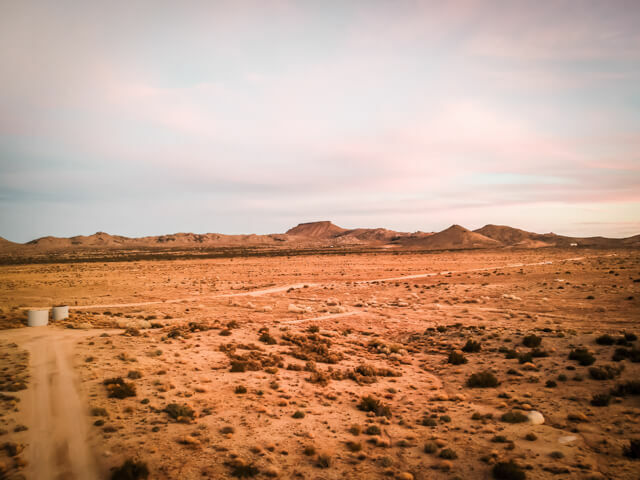 Still one of my favorite views of this trip, it was just miles of desert probably the same way many have seen it before us for a hundred plus years as they made the same journey. 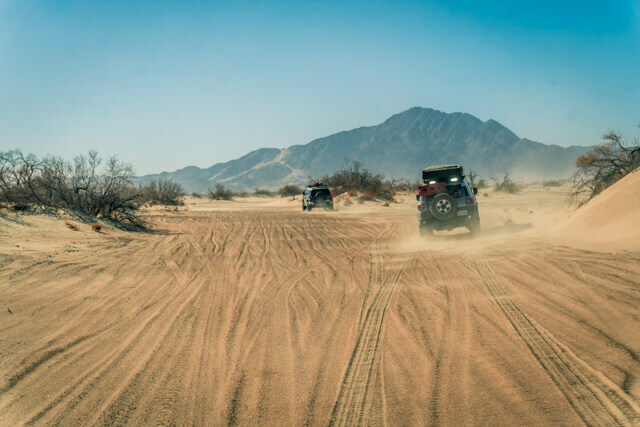 Our next stop was the Mojave Mail Box, miles of whoops and rough slow-going bouncing road ate up the morning as we arrived at the mailbox. 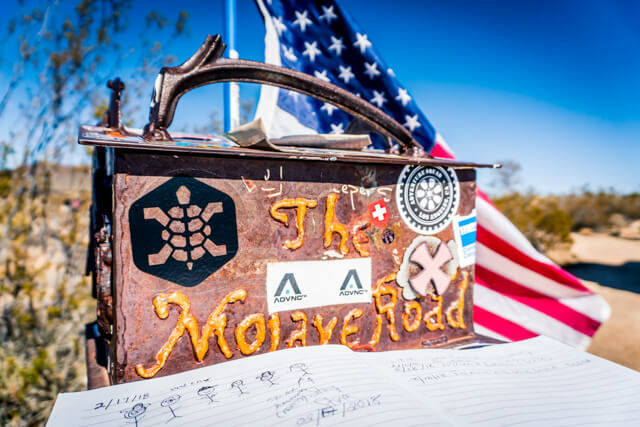 The Mailbox is awesome, it contains the Mojave Road “guest book”. Travelers sign in from all over the world, leaving their mark and adding it to the history of the road. Placed in 1983 by the Friends of the Mojave Road it helps log the traffic the road gets to keep the road going. 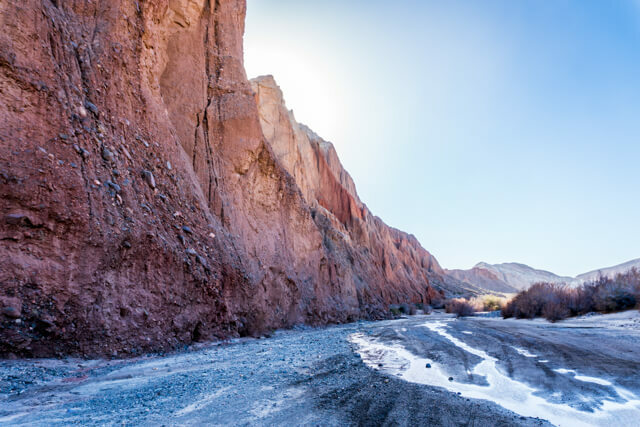 While the road itself is unmaintained, why it is a challenge, many landmarks and features are maintained and protected by this conservancy group. The Mailbox is also home to a patchwork of little collections. People bring the themed trinkets of their choice to add to these collections. 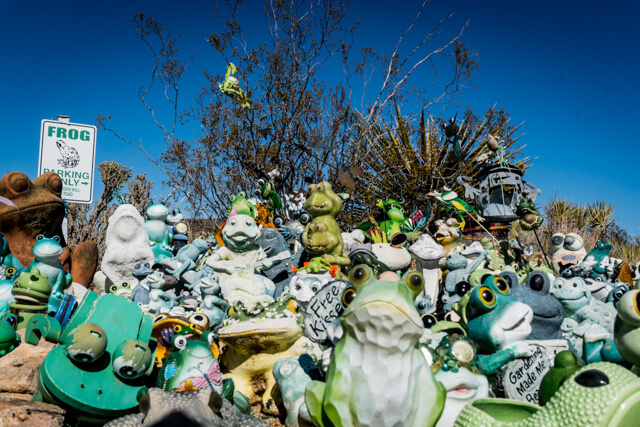 Everything from frogs, to Jeep Hill and Penguins and more. It’s fun and weird, just like the road! We hit the road again this time had some fun fast double-track on our way to the Lava Tube. The terrain changes again to lava rocks and dark hills and old volcano mounds thousands of years old. It’s like another planet where dinosaurs still roam. Here we hike and crawl down into the famous lava tube with perfect timing. 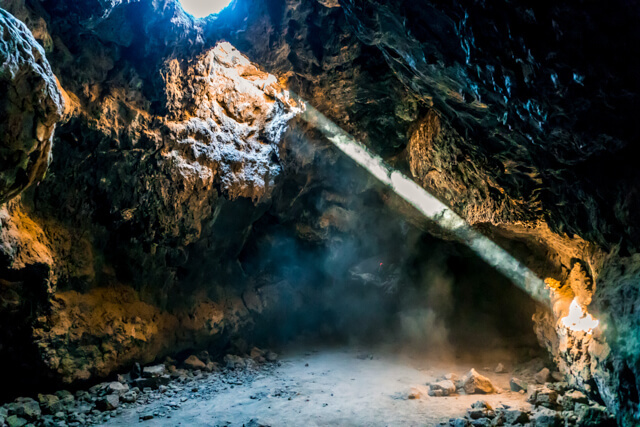 You want to get there around mid-day to catch the amazingly intense and focused beam the sun creates in this underground tube of ancient lava rock. And it’s here that we lost our 2nd man. He had to head home, so he peeled off to the highway and we continued, just 3 FJ Cruisers now. 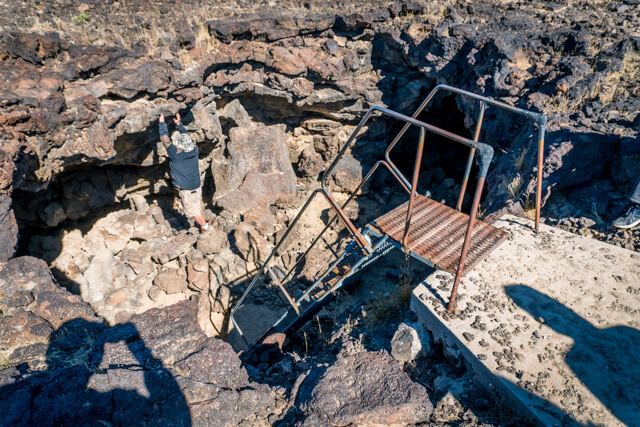 The ladder leading down to the Lava Tube. Shafts of light illuminate the Lava Tube. Another batch of dusty miles and another terrain, this time salt flats! 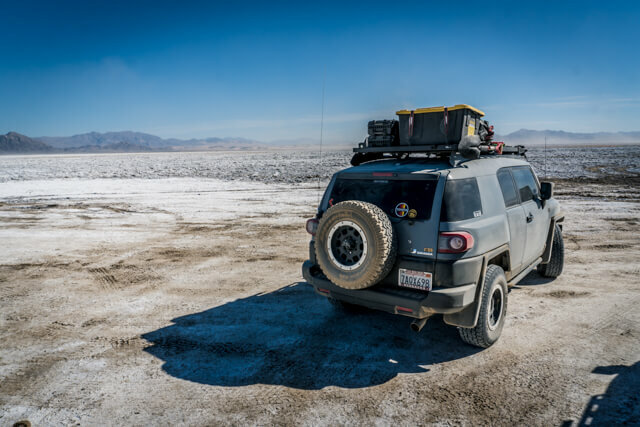 AN incredible white dry lake bed with a strange monument off in the distance. [In case you haven’t noticed the road is packed with weird man-made “monuments”] By this time the winds are howling at 45mph. This one would be a pile of rocks called “Travelers Monument”, read the plaque, it’s worth it. At this one the tradition is you pick up a rock when you start the road (or along the way) and you deposit the rock here. Adding your story to the pile of stories on this road. And so this rock monument grows, in the middle of a dry lake bed in the middle of the Mojave desert. I love this place. We left the monument and lake bed and straight into a few miles of rock garden again that quickly gave way to sand dunes as far as the eye could see. This was again, truly amazing and unique. It was like being transported to the great Sahara desert. Winds whipping across the dunes and road upwards of 45mph made the sand dance in front of you in mesmerizing patterns. Our journey is almost over. The dunes pour into Afton Canyon. This is the beginning of the end marked by an old steel bridge and another traditional photo opportunity. 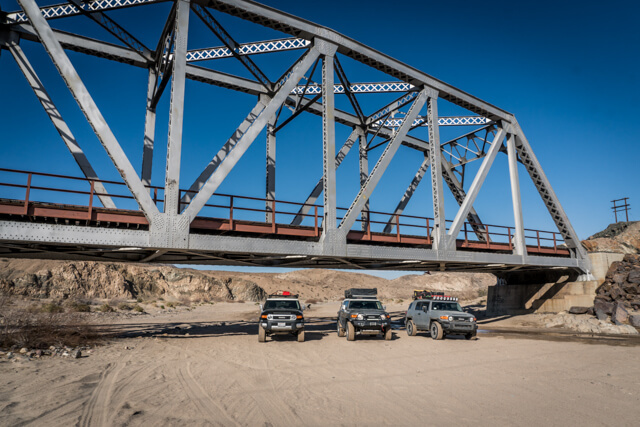 As we head deeper into the canyon we begin to see water, eluding to the water crossing that marks the finale of the Mojave Road. 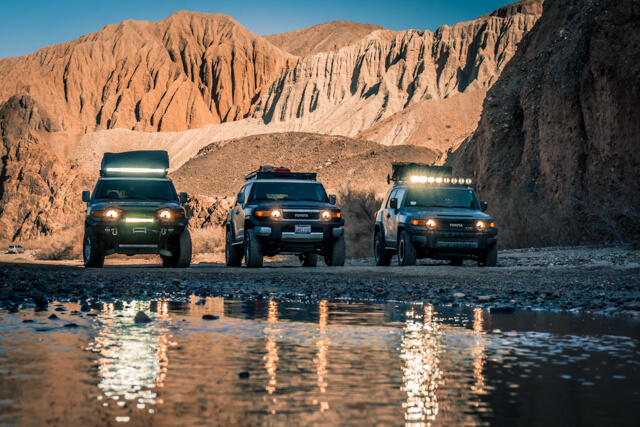 Time to stop for one last group shot, 3 FJ’s adventuring across this long historic road like so many before us. This has been one of the most amazing and beautiful adventures I have been on in my own backyard. If you think the desert is the same all the way across and just one big bowl of brown dusty sand, you’re wrong and you owe it to yourself to discover that. I use an iPad Mini for navigation paired with GAIA GPS, so far my favorite and most reliable combo for offline maps. 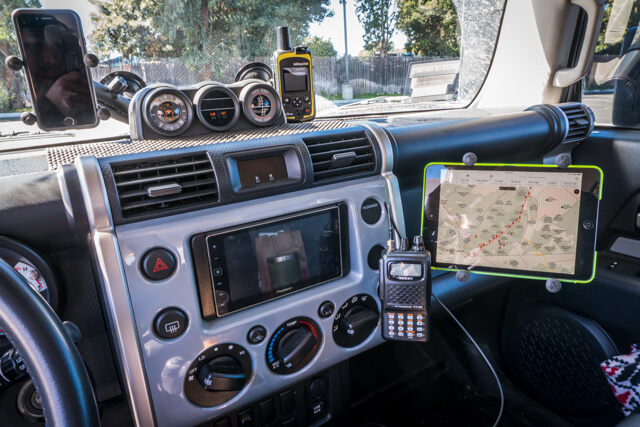 iPad is paired to a DeLorme (now Garmin) inReach. The inReach is hands down my lifeline in the backcountry. This is my GPS, it’s my way to text my wife and family and also track my progress on a map, and it’s an emergency beacon. If I ever get in trouble it will send an SOS to a 24-hour monitored station anywhere in the world. It’s my insurance policy. For Comms, I use a ham radio setup and my trusty Yaesu FT-60. Lastly my iPhone for capturing those moments and running my play list! I also carry my Sony a6300 wherever I go to document my adventures. 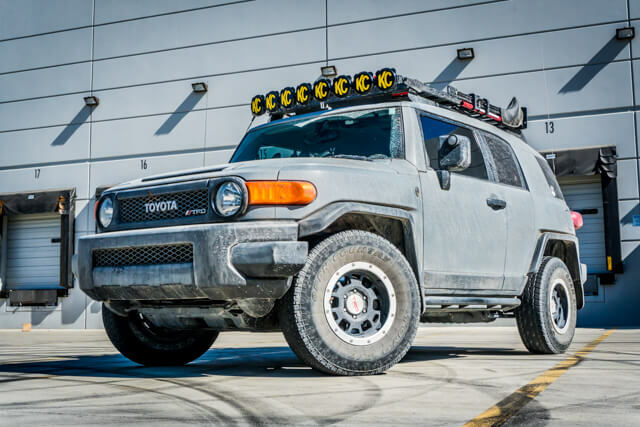 None of this would be possible without my reliable Trail Turtle, Trucky McTruckface. 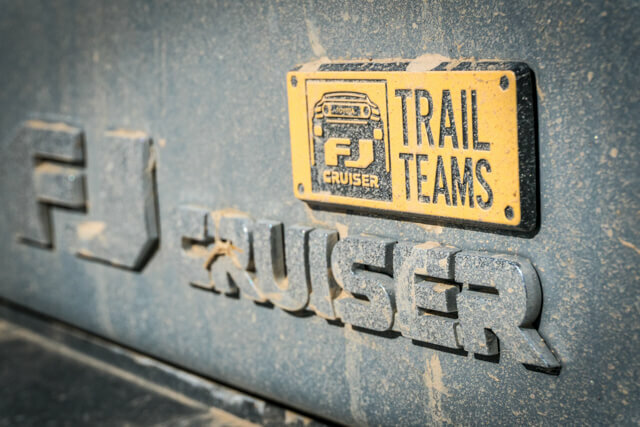 This 2013 FJ Cruiser Trail Teams has been amazing and so far has not let me down (knock on wood). 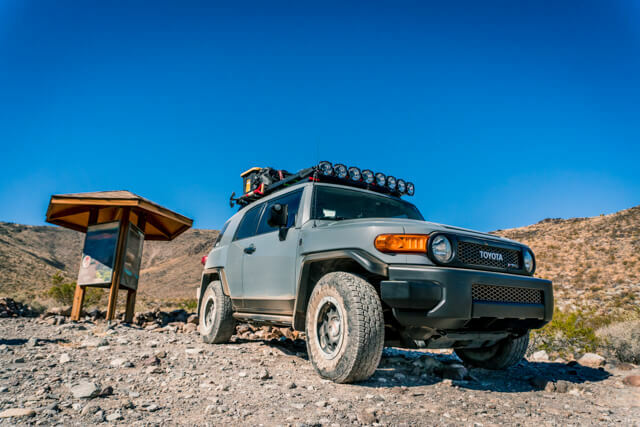 You can do this, all you need is 4×4, some hunger for adventure, and the Mojave Road Guidebook. Seriously, get it. There’s no point in doing this adventure if you can’t appreciate what you’re looking at. You could very well miss some of the most amazing things on this road. Thanks to SCOTA for guiding me on this trip, Frank (not me) and Will for finishing out the road. I’ll never forget this gem. Check out the creative way Frank Customized his Gravity Pro6 Lights on his Instagram here. Perfect for breakfast, lunch, and dinner on the trail! Read more about our favorite Vegetarian Freeze Dried Meals here. The perfect camera to capture those breathtaking moments on the trail. The Scouts would like to thank Frank for allowing us to share this story on ScoutOfMind.com! 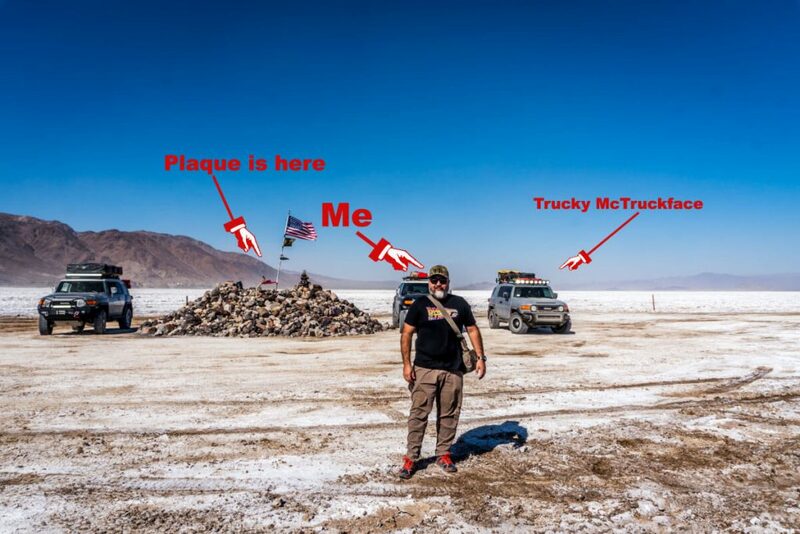 Be sure to follow Frank @Trucky_McTruckFace for more of his adventures. It’s illegal to fly drones in national parks or areas managed by the NPS.